Primitivo, an important red wine grape of southern Italy, is less well-known in the United States than its close cousin, zinfandel. 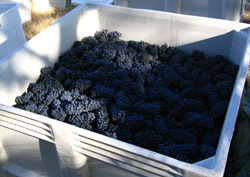 Primitivo has relatively little acreage by name in California, but the so-called primitivo clone of zinfandel is, in fact, widely planted and considered by many to be an excellent clone. 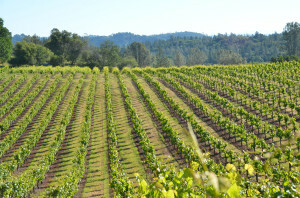 Amador County vineyards have taken the lead in bottling primitivo as a varietal wine in California with excellent results, but other regions have recently followed. Primitivo, like zinfandel, is a versatile grape, and produces a hearty red wine variously described as being spicier or more fruit-forward than zinfandel. Our primitivo grapes are planted on a gently south-southwest-facing slope of Shaker Ridge Vineyard. The entire primitivo vineyard is planted with the 03 clone of primitivo on drought- and phylloxera-resistant St. George rootstock. The primitvo are trained on a vertical cordon. The soils in the primitivo portion of the vineyard are mostly the same rocky red clay loam soils of the barbera vineyard, although the western portion of the vineyard transitions to brownish, slate-containing soils. The primitivo undergoes budburst perhaps 1-2 weeks later than the barbera, but ripens earlier, in the early to mid September time frame at Shaker Ridge.